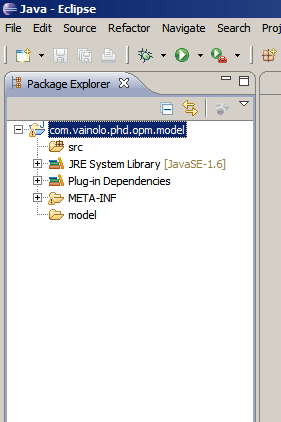 I am creating a new editor for the Object-Process Methodology Modeling language. Since at the same time I am learning both EMF and GEF, it seems a good opportunity to share what I learn. This first tutorial will describe how to create an EMF model. You may ask why I am using EMF and not writing my own plain-vanilla model? there is no simple answer to this, except that EMF seems to include a large amount of build-in functionality that will reduce the time it takes me to develop the editor (although the learning curve is pretty tough), such as persistency and notifications. 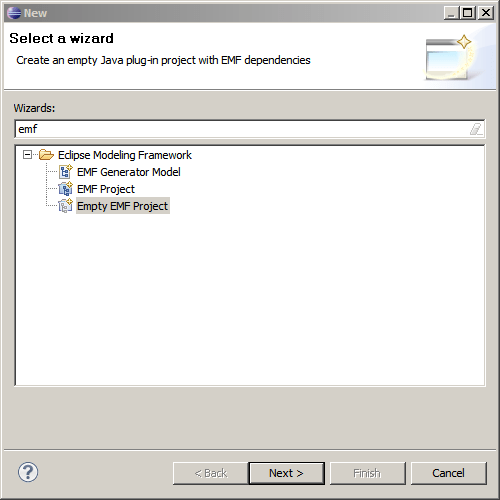 The tutorial was done on eclipse “Helios Service Release 2” (which you can download here) and includes EMF and GEF plugins that you can download from the platform. Well, let’s get to work. The second page of the wizard lets you decide the project’s name. 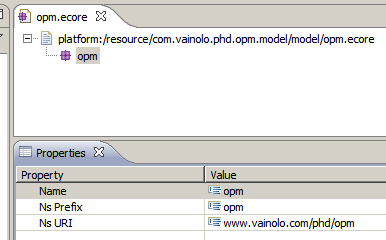 Since this is a project for my PhD, and I am creating a model of OPM, this name seems to fit just right. 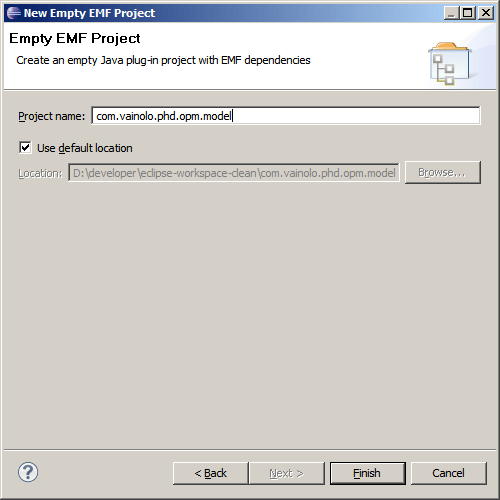 Your workspace should now contain the project, which includes a “model” directory where the EMF model files will be added. We now create the Ecore model. 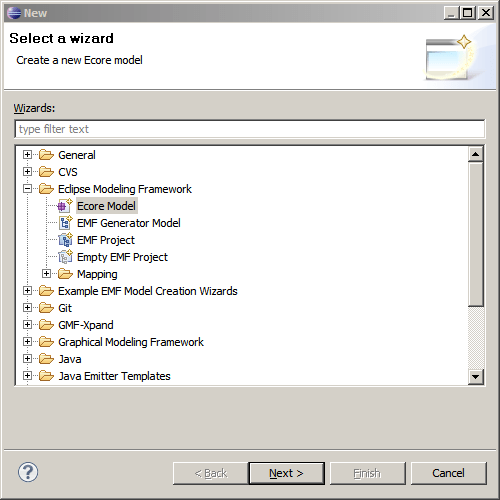 Select the “model” directory, right click and select “New->Other…” and search for “Ecore Model” in the wizard. Clicking “Next” lets us select the name of the Ecore file, and its location. My model will be called “opm” (for obvious reasons). ObjectProcessDiagram: the diagram container where diagram elements are drawn. Also known as OPD. OPMObject: one of the two basic OPM “things” (if you are interested, you can read more about OPM here). OPMProcess: the second basic “thing” of OPM. 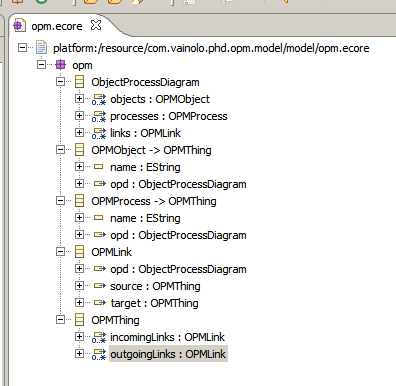 OPMLink: a relation between to “things” in an OPD. Repeat the above procedure for OPMProcess (and you will excuse me for not adding another screenshot). Adding the processes and links references should now be fairly easy even for me :-). Don’t forget to set containment=true. Notice that since OPMObject is contained in ObjectProcessDiagram, after you select the EOpposite reference the Container property of the reference from OPMObject to ObjectProcessDiagram changes to true. While not very important, this is nice. And that’s all for today. Now I understand why people don’t write long and detailed tutorials… but it is definitely time well spent. How you enjoy it. On the next chapter of “Creating a GEF editor” (which will be much shorter), we will create an EMF Generator Model to generate code from the model we just did. Oh, and another thing: if you want to learn some more EMF, Lars Vogel has a nice tutorial that uses the EMF graphical modeling tool (which is nice but a bit overkill for my current needs). ← A Ad Add Adds! n your sense of humor is excellent. Is there any practical use of ObjectProcessDiagram to have attribute ‘links’? I have noticed no use so far and I am wondering if it is something for future use? Also, this only gave me a problem of displaying an extra link in the top left corner. I have added links from the ObjectProcessDiagram to the getModelChildren() method of OPMObjectProcessDiagramEditPart class, which I thought is only natural. Now I know that root element is not in charge of links, but rather elements which are connected by those links. Hi Bojan. I decided to model all links as being contained in the OPM, and not as contained in either the source or the target, and this is why the OPD has an attribute ‘links’. I did this because all objects in an EMF model need to be contained somewhere and instead of setting arbitrarily that links are contained in the source or in the target, they are contained in the OPD. Links should only exist between OPM things (objects and processes). 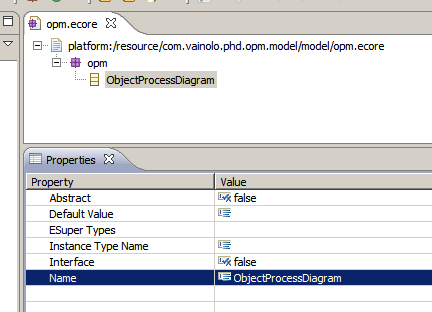 The OPMObjectProcessEditPart is the ‘canvas’ of the editor and the links are created by the element contained in the editor (objects and processes). Could you please tell me how to install GEF? I try to do it but i have a bug and i could not fix it. Please search Google or StackOverflow on this topic. I will happily answer int this site questions regarding my tutorials. Good luck. first of all apologize for writing in this space but is a bit urgent. you know like Customizing Selection Handles of GEF figures, have any example for this?